Around closing time on a Tuesday afternoon, a man walks into Raleigh’s A Place at the Table cafe and looks around. “Y’all need any help closing up?” he asks. Maggie Kane, the restaurant’s founder and executive director, is the first to greet him. She tells him he’s welcome to volunteer. “But do you want something to eat first?” she asks, pointing to the menu on the wall. 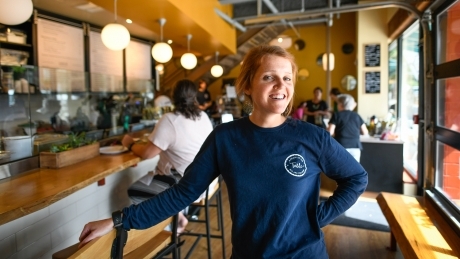 Alumna Maggie Kane (International Studies ’13) founded A Place at the Table café in downtown Raleigh, a “pay-what-you-can” restaurant that gives patrons several options to pay for their meal — and pay it forward for others. “I can’t afford it,” the man says. At A Place at the Table, everybody eats. All are welcome. 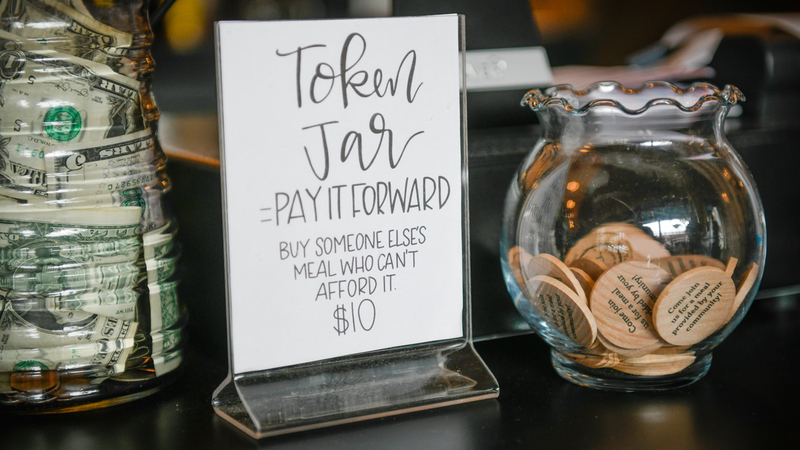 Operating with a flexible “pay-what-you-can” model, the cafe gives patrons several options to pay for their meals — and to pay it forward for others. If someone doesn’t have enough cash, they can pay half the price or volunteer with the restaurant for their meal. 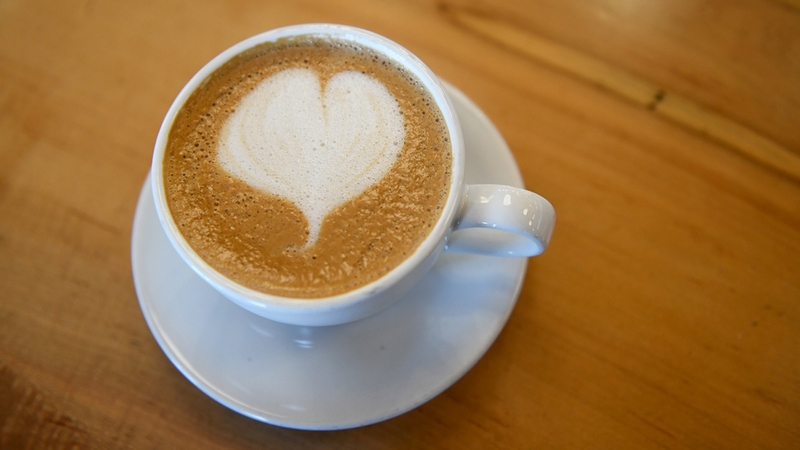 If another customer wants to tip $40 on a cup of coffee or buy a meal token for someone else, that’s cool, too. Kane had the idea for A Place at the Table about four years ago, not long after earning her bachelor’s degree in international studies from NC State. After visiting local soup kitchens with people experiencing homelessness and poverty, she set out to build a new restaurant where all people could order from a menu, break bread and have dignity while they dined. Today, that vision is becoming reality. 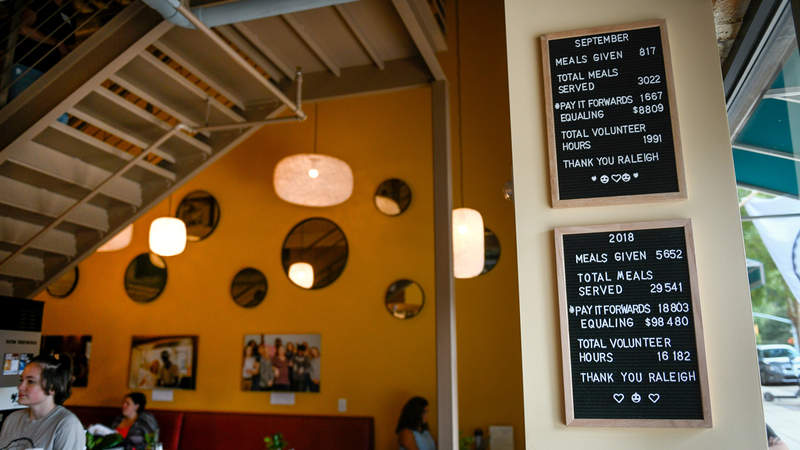 After opening in early 2018, A Place at the Table serves 20-40 people daily who volunteer for their meal. Meanwhile, the vast majority of customers are paying the suggested menu prices or more, an essential factor in keeping the operation afloat. But evidence of the cafe’s success extends beyond numbers. Kane sees it in the interactions between customers and volunteers from all walks of life. Open from early morning to early afternoon daily, A Place at the Table serves a variety of breakfast and lunch plates ranging from chai spiced waffles and granola bowls to a pulled pork panini and a quinoa, roasted vegetable and mixed green salad. Paying the suggested menu price. Paying half the suggested price. Paying nothing, and volunteering with the restaurant. Adding a tip to their bill. Buying a $10 meal token for someone in the community. A Place at the Table serves 20-40 people daily who volunteer for their meal. The model works when 80 percent of customers pay the suggested menu prices or more. That allows the cafe to pay the bills while also providing meals to customers who don’t have the money. As a nonprofit, A Place at the Table also receives support from donors and from volunteers who sign up to do dishes, serve food and tackle other chores. Beth Swartz, a former teacher and A Place at the Table board member, volunteers at the cafe about three days a week. She can attest not only to the delectability of the food — “Our chef is amazing,” she says — but also the unique community being created. Beyond the pricing model, the food and the communal feel, Swartz says the restaurant has another draw: Kane’s presence and leadership. She says many of the customers experiencing homelessness or poverty know and trust her. As a matter of fact, Swartz says, it’s not uncommon to hear people refer to A Place at the Table by a nickname growing in popularity: Maggie’s Cafe. At A Place at the Table, patrons can purchase $10 meal tokens for people in need. Patrons can leave the tokens with the cafe or hand them out in the community. The “pay-what-you-can” model works when 80 percent of customers pay the suggested menu prices or more. That allows the cafe to pay the bills while also providing meals to customers who don’t have the money. Kane, a native of Raleigh, says she figured out what to do with her life at NC State. Concentrating her degree in international studies, she crafted an interdisciplinary course load that helped her envision a path for the future. She took courses in her favorite language, Italian, but also had classes in accounting. She explored theories in psychology and political science as well as business and economics. Support NC State students who experience homelessness, food insecurity and other hardships. Fill out our form to contribute funds, goods or expertise to help address this challenge on campus. At NC State, Kane also began her work with nonprofits. She volunteered with a campus ministry and a service fraternity, which provided an opportunity to work with Raleigh’s homeless population. After graduating in 2013, those experiences led to a job with Love Wins Ministries, a day shelter where people could go for food, coffee and support. Through her job, Kane often visited soup kitchens with the folks she met at the shelter. The experience was always the same. “We would stand in line, we’d get handed a plate and then we’d have to eat in five minutes,” Kane says. It’s a logical system to fulfill the life-saving mission of a soup kitchen: serve and feed as many people as possible. Kane pondered what could be different. She asked herself, How can we fulfill this hunger need in an environment that also affords choice, dignity and conversation? In considering this question, Kane began taking members of the local homeless population to dinner on special occasions. For birthdays or anniversaries, she let them pick the place. We aren’t different; we just have different circumstances and environments. “I noticed that a lot of times they wanted to go to Golden Corral and K&W, because there was so much choice, and it was a nice setting,” Kane says. She imagined a place where all people could go to have a good meal and spend hours breaking bread together. After doing some research, Kane found the “pay-what-you-can” model, which she says more than 60 restaurants have adopted across the nation. One of the closest to Raleigh is the F.A.R.M. Cafe in Boone, North Carolina. Kane visited the restaurant several times, fell in love with the concept and decided in 2014 to bring the model to Raleigh. For the next four years, she worked with a “visionary team” of accountants, lawyers, restaurant owners and many others to build support for A Place at the Table. They raised money for the cafe through fundraisers and pop-up brunches around Raleigh, one of which drew 400 people in a span of three hours. In 2017, a space opened up on Hargett Street in downtown Raleigh. The cafe opened its doors in January. Dynamic arts leaders from around the Raleigh area convened together on February 28th, 2019, to discuss what sustainability means to them, and how they have captured the entrepreneurial spirit through their work with their arts organizations.